Today was an exciting day! 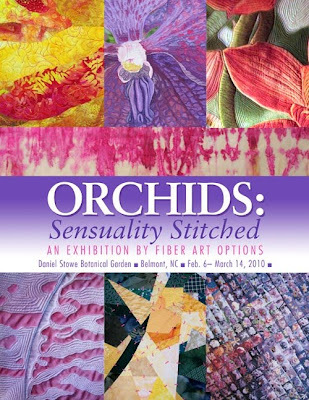 We hung Fiber Art Options’ show, “Orchids: Sensuality Stitched,” at the Daniel Stowe Botanical Garden (DSBG). 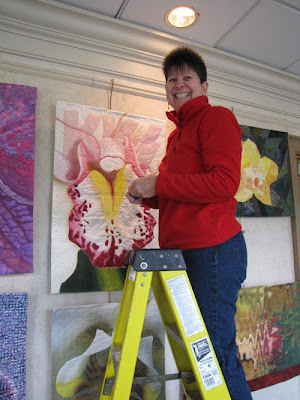 The photo above shows us almost done with hanging and arranging the pieces. Here are some of the signs I designed that will hang with the exhibition. They will introduce the idea behind the exhibition, tell about the group, and explain the techniques we used. P.J. Howard was our primary ladder climber (and doesn’t that light right over her head look like a little halo? She really is very angelic, but with a wicked sense of humor!). That’s Grace’s piece behind her, which references the bassist for the band KISS (Gene Simmons’) tongue. 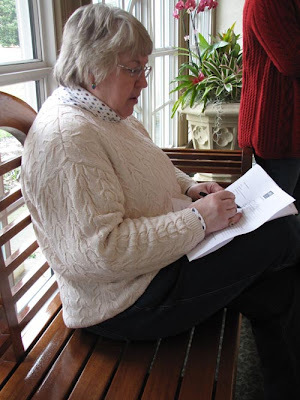 Here’s Nancy Cook filling out a commission form (below). 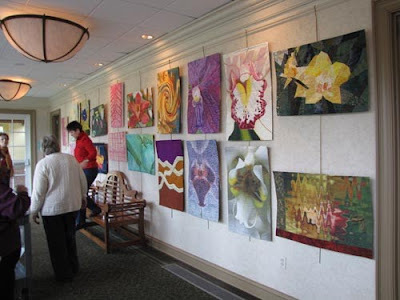 All of the pieces in the exhibition are for sale (the range is between $100 and $2,500) and the forms are an agreement between DSBG and the artists. After all of the pieces were up, we stood back and decided if anything needed to go higher or lower, or be moved to a different spot. We tried to mix up the pieces (so that they were not grouped by artist) and to ensure that their placement complimented each other. 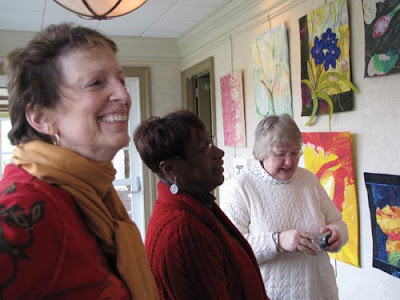 Here is (from left:) Deborah Langsam, Grace Howes, and Nancy checking out the placement. 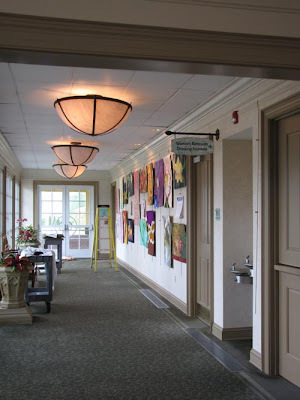 After that, we moved out into the main area to arrange the seven smaller pieces. 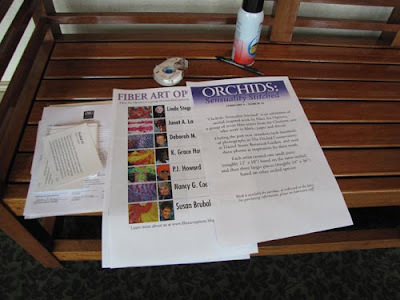 Each one of us had done one 12 x 18" piece based on the same orchid species, a white Phalaenopsis with pink stripes. It was amazing how different each of these pieces were. Again, all were placed on a sheet on the floor and moved around until we found a pleasing arrangement. Then came the measurements and the math, trying to place everything up on “the cube,” a moveable display. That’s Cynthia Klemmer, DSBG’s Director of Education, on the left, in purple. She stayed with us until we had the whole show up, and has been incredibly helpful and great to work with every step of the way as we got ready for the show. 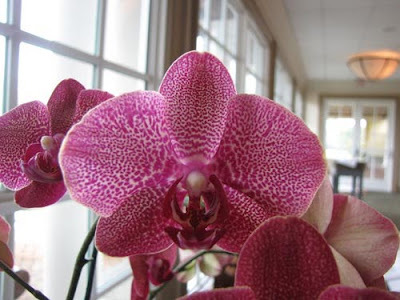 There are even live orchids in the hall with our work! 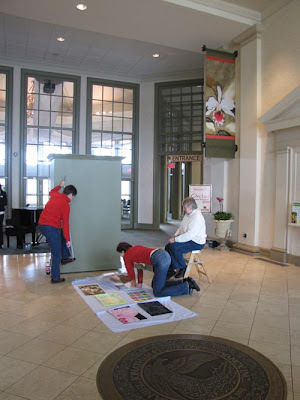 And come see us at DSBG this weekend, Feb. 6 and 7, from noon to 4 p.m. each day. We’ll be doing walk-throughs of the exhibition and demonstrations. We’d love to see you! 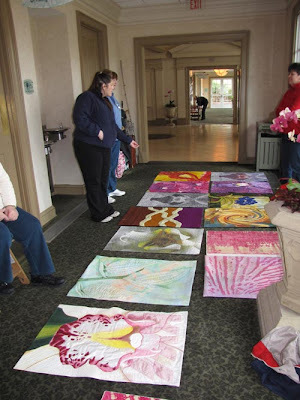 Happy Jig, Happy Jig, all four orchid quilts are finished down to being signed, labeled and hanging systems completed. 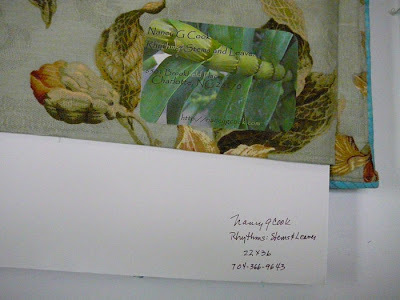 Sneak previews are available on my blog at http://nancygcook.blogspot.com. Here is how the finished backs of my 4 orchid pieces look. My DH gave me some time, creativity, and skills to devise the hanging systems this morning. Hint: You may want to stop reading here, if you do not want the full details of the hanging system. 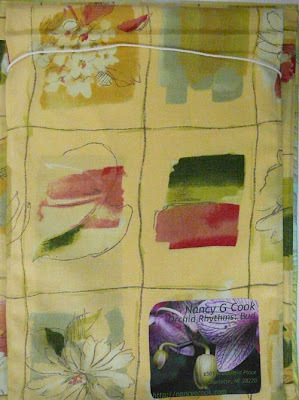 The quilts hang from a non stretching cord that goes through a supporting form core which goes into a full sleeve. The full sleeve covers the back. The sleeve is sewed down to the top facing and the sides. The top of each sleeve side is left open for the first 4 inches and has a 1/4 inch tuck for ease. The bottom of the sleeve is hemmed and left open in order to insert the foam core. 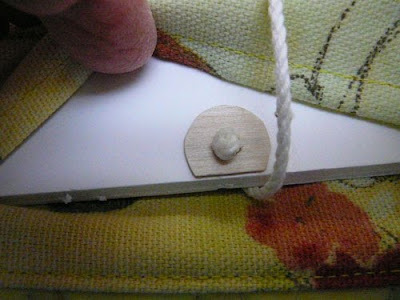 Cord is stiffened with glue to ease threading it through small openings in the foam core. To keep the foam core from tearing, my DH cut, drilled and glued thin wooden reinforcers to each side of the drilled holes in the foam core. My DH is a wonder. He created this nice piece of engineering. 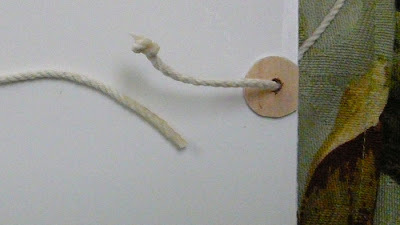 This photo shows the sleeve being pulled back to reveal the cord and reinforcement. We found that the quilt hangs better if the cord enters from the front to the back of the foam core The cord was threaded into the front of the foam core and then wrapped around the side of the foam core to the front to cross to the other side of the quilt. 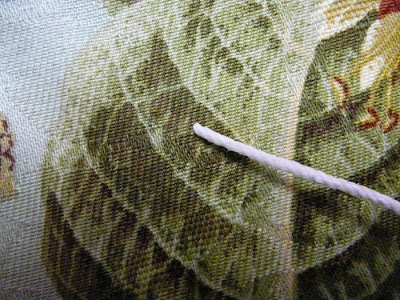 That leaves the knots next to the sleeve not the quilt as is seen in the photo. 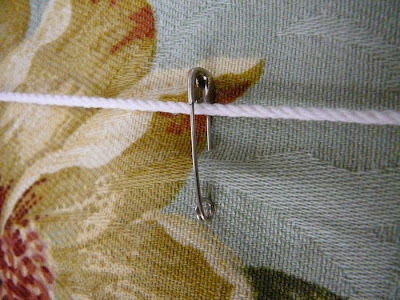 When the widest quilt was hung we found that the cord showed above the quilt, so I used a hint from PJ to take up some slack with safety pins. The pins could be moved around until we removed sufficient slack. This photo shows the bottom of the quilt back showing the full sleeve, the quilt label and the information on the foam core. Each foam core has the quilt title, my name, sizes and my telephone number. 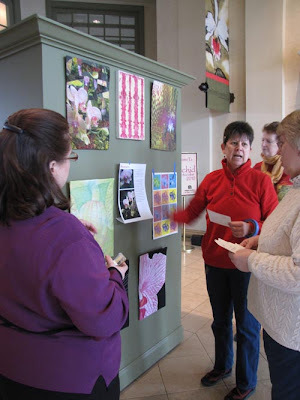 Each quilt has a label with even more contact information and a photograph of the inspiration. Hope this explanation is not too confusing.